Sometimes you want a sticky situation. For wet and slippery missions, there’s Cairn 3D Pro, our ultimate adventure sandal outfitted with an extra-sticky Vibram® Megagrip outsole and our new molded footbed. Pro Megagrip Vibram® Sole: Super sticky + grippy rubber designed to perform in slippery conditions. Non-marking, Andesite-Grey outsole color, and Re-Soulable. Cairn 3D Pro features a zero-drop anatomically molded footbed, with tasteful arch and toe support. Built for those seeking extra support or looking to log big miles. Our Patent-Pending design features premium webbing, 3 adjustment zones, and our sole-hugger wings for locked-in stability. Premium Quality: We spent years sourcing the best materials in the world, so you can spend maximum time enjoying the outdoors. The Cairn is USA Assembled of Domestic and Foreign Parts. 1% For the Planet: We proudly donate 1% of your purchase to environmental non-profits. Our sizing is unisex (e.g. size 9/10 is equivalent to size 9 for men, and size 10 for women.) Some Bedrockers find our sizes run slightly small, especially in our smallest sizes. View/Download/Print our Cairn Sandals Sole Templates. For footbed's sake, do not leave your sandals in extreme heat (e.g. hot car) or intense direct sun exposure for durations ( e.g. sunny porch). 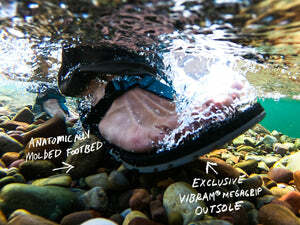 Our ultralight Go Far Vibram® footbeds can warp if left exposed in these environments. All Cairn 3D Pro Sandals are made with 100% vegan materials and construction. Ultra-grippy, exclusive REGOLITH Bedrock x Vibram® sole made with Megagrip. Our new Geo-patterned footbed features macro pentagonal-grooves on the sole, providing excellent grip in both dry and wet conditions, and more aeration power to keep your feet less sweaty. At 16 mm base stack height under the forefoot, the new molded Cairn 3D Vibram® sole is a union of freedom and support. Zero Drop from toe to heel. Strap System: No-Slip Secure Fit. We spent years sourcing the best materials, so you can spend maximum time enjoying the outdoors. With exclusive Vibram® rubber soling, polyester and nylon webbing upper, metal and acetal plastic hardware, and US military-grade Velcro®, you’ll do just that. This is my second pair of Bedrocks. The first were the original classics and my latest are the Cairn 3D Pros. What can I say that others haven't? Not much to add here. They are stable, durable and trustworthy. Ya'll have hit it out of the park with this design. Nice work Bedrock! 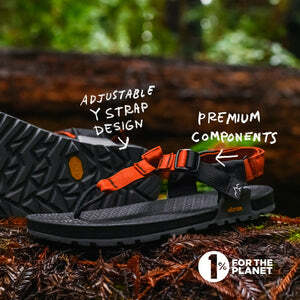 Probably the best strap system of minimalist sandals out there. I’ve never been a fan of something between my toes, but I don’t even notice while wearing these. The Bedrocks are unique, they look good, and work for a variety of activities. I have only had these around 2 weeks so I probably don't have enough time wearing these yet but BedRock wanted a review. The strap adjustment guide they sent was nice and I think I have them adjusted pretty good for my feet. I wear my sandals everyday when I walk my dog and they have just been ok, the sole's seems very hard. I bought the Pro sandals because I didn't want issues in wet or dry, the sole also claims to be "sticky" so you wont slip. I have had issues with these being slippery, I have cobble stone around my neighborhood and they slide around on them. I am going to go camping in the next week and that should be a better test of what these are capable of, unless they become too uncomfortable then I will switch over to my Marmots. Ordered some Regular Cairns when I meant to order Cairn 3Ds. Sent a note to customer service Sunday night after I ordered and they got back to me Monday morning and revised my order very quickly and still got the sandals 3 days later, awesome service. Sandals are fantastic, mostly bought for on the river this summer and every day wear. Also used the sizing print offs and when I got my sandals they fit perfectly and quality is fantastic. Great experience from top to bottom. Stoked! To be honest, I thought they would be more comfortable than they are. They’re not bad, but would not have purchased if I’d known. Too expensive not to be perfect.